I was lucky enough to have spent late September and early October 2017 in the Maldives. 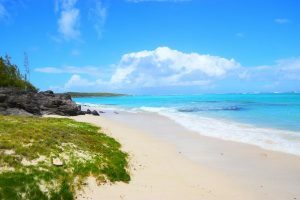 In 27 days there I managed to visit more islands, both resort islands and local islands just to be able to compare them and know the difference. One of the local islands I stayed at was Gaafaru. 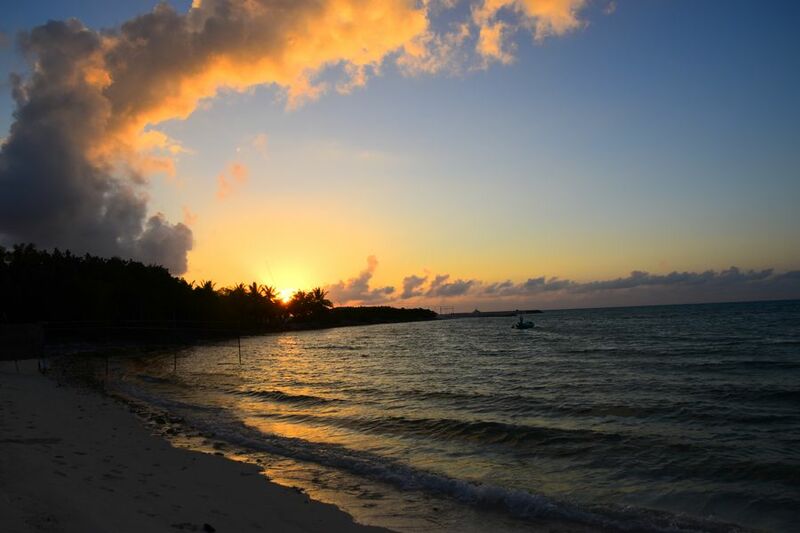 In this article I will mention the must sees and things to do in Gaafaru Maldives. But first, where is Gaafaru? Maldives consist of more than 1,100 islands which form different atolls. Gaafaru is a very small island located in the North of Male capital. 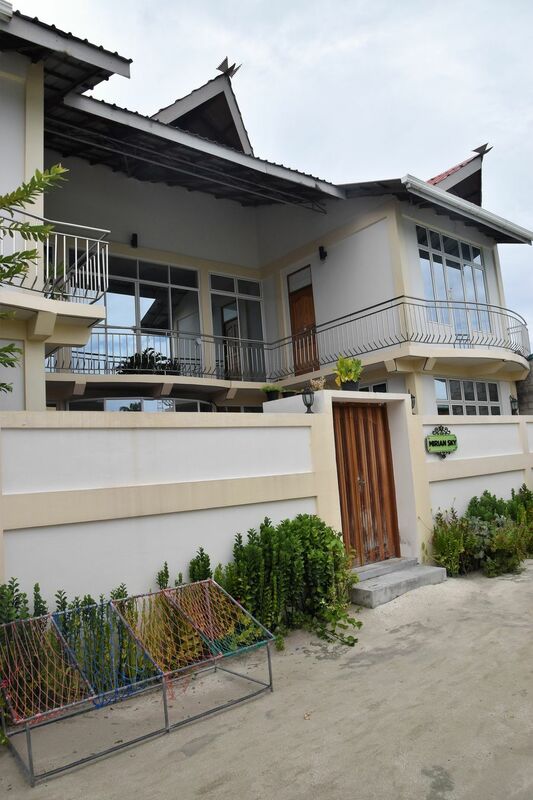 It’s situated exactly 61 km North from the international airport. It’s separated by a deep narrow channel from the Northern most island of the North Male Atoll (that’s the picnic island Kagi I mention below). Gaafaru island is the only island of the natural atoll carrying the same name of Gaafaru. However, Gaafaru is also part of the Kaafu Atoll. It is located in the Eastern part of the atoll. Basically, Gaafaru is a tiny island surounded by a big reef and lagoon which is up to 30 m deep. That makes it a perfect local island experience in Maldives. 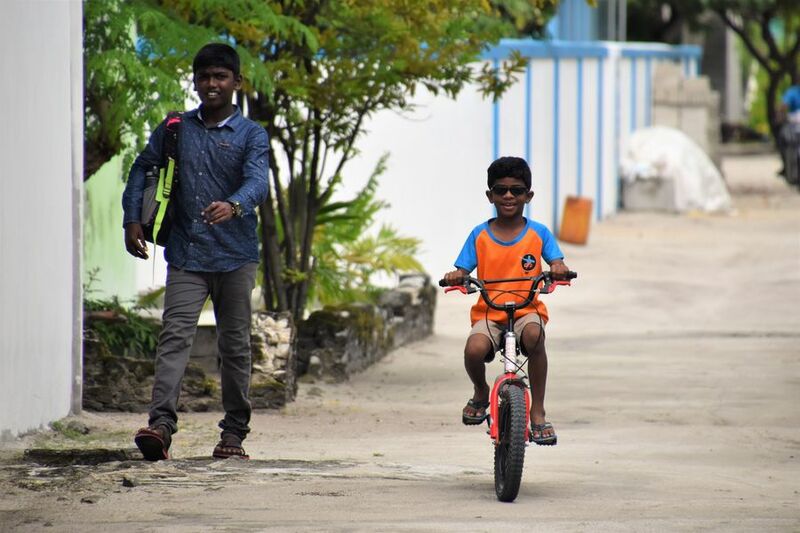 I really hope that this article will be useful for you if you decide to visit Gaafaru. There’s not that much information online about Gaafaru Maldives yet as in 2017 the island had 1 hotel only 🙂 Yes, you hear me right. In 2017 when I visited Gaafaru there was just the Mirian Sky Hotel Gaafaru which opened only in 2016. That’s exactly the Gaafaru hotel where I stayed at, too. So it’s logical there’s not that much information about the island as tourists would not go there until 2016. Now there’s a couple of more hotels and guesthouses being built on the island which will attract more visitors. But I recommend you to visit Gaafaru asap. 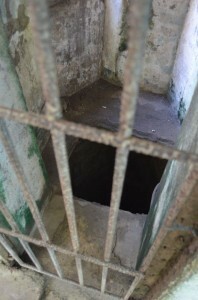 You might get as lucky as I did and be the only tourist on the island. Yes, when I stayed there, there were no other tourists at the Mirian Sky hotel which felt really unique to me. Being the only guest on the whole island let me explore Gaafaru even better. 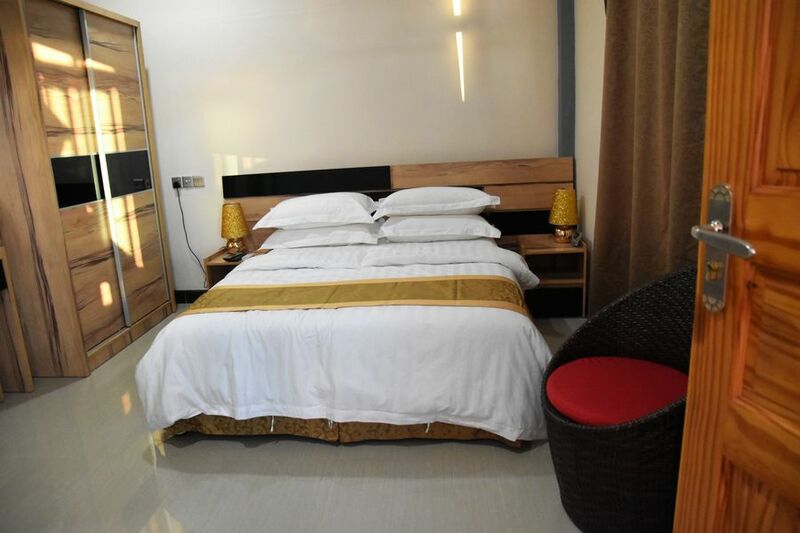 Mirian Sky Gaafaru is a lovely small hotel with 8 rooms on 2 floors. I had a room on the second floor overlooking the roofs of local houses. From the other side you could see the local mosque which was one of the unique experiences on Gaafaru. You could watch the locals praying there from the balcony. 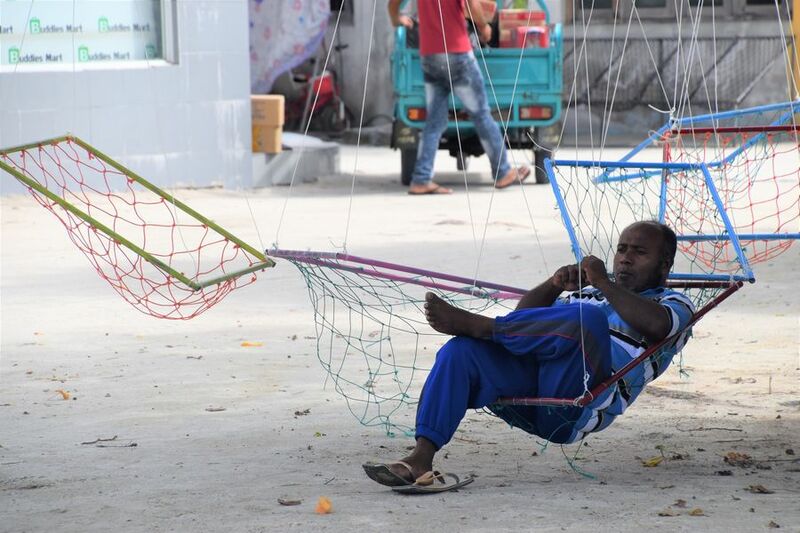 As I’ve said, Gaafaru Maldives is a perfect place to learn more about the life of the locals. 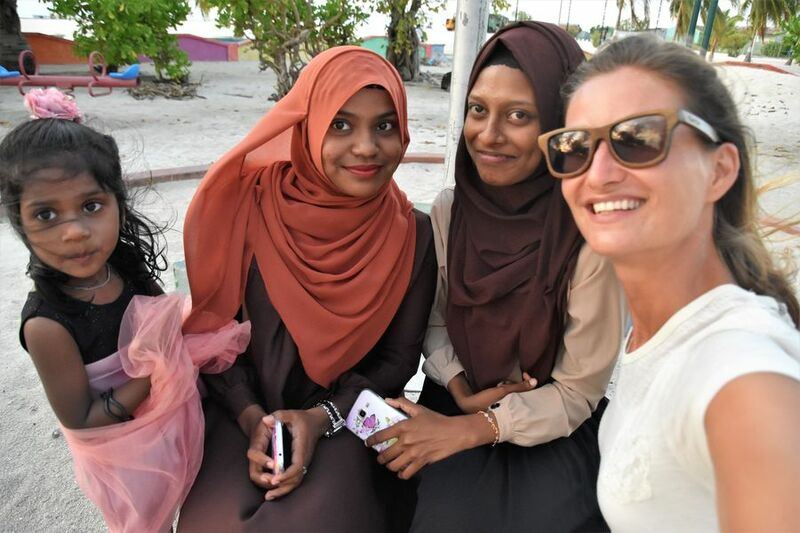 Many people go to Maldives and stay only at a resort which does not give them any chance to find out how the locals live. For that, you need to stay at a local island, such as Gaafaru. 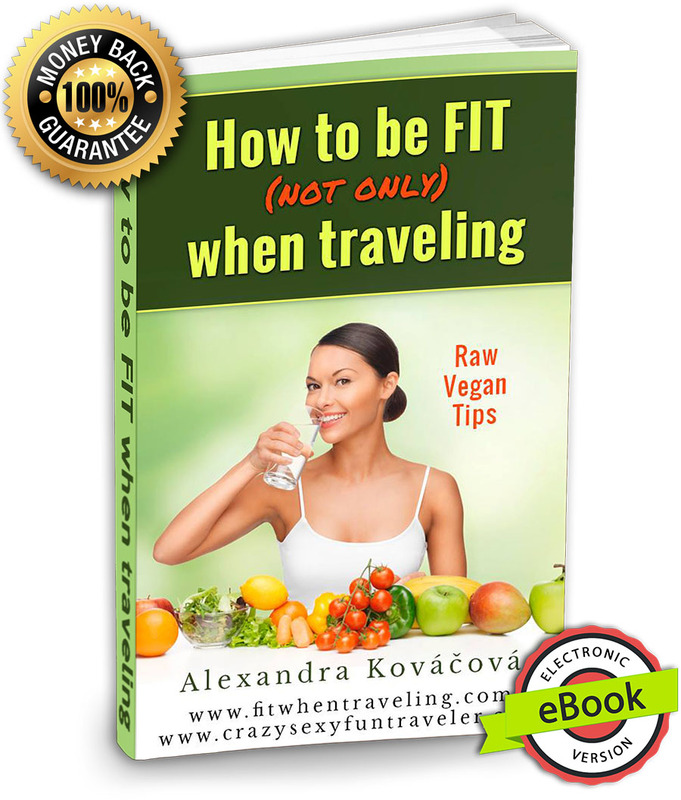 And because now in 2017 there’s only 1 hotel there, the local experience will be even more unique. The locals are not really used to tourists yet which gives you an opportunity to really get to know the Maldivian habits. 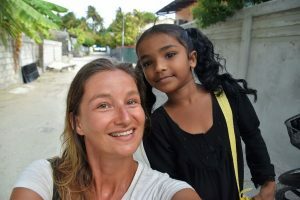 I went for a barefoot walk every day while in Gaafaru. I tried to go at different times of the day to see more of local activities. My favorite time was sunset when the kids were back from school and they would play at the big colorful playground not far from the port. When I was there, they got curious and wanted to play with me, too. At that time the adults would swing in the funny swings below the trees found all around the island. TIP: Mingle with locals at Island Deck. Island Deck is a famous coffee shop located just a couple of metres from the Gaafaru port. You can take steps up to the roof to watch the sunset in the port. Many locals go there to get a coffee. There’s some shells and corals along the beach after high tide. Feel free to admire their beauty. Oh, and the sunset from the beach is also cool. The sunset is somewhere in the port and not directly at the Bikini beach but it’s still visible. I didn’t really swim there much because of some algae and corals close-by. I would only But I think it wold be possible to go for a swim. There’s a couple of free sunbeds on the beach to sunbathe on. If you got bored, you can rent a canoe at Mirian Sky Hotel or go on a banana boat. 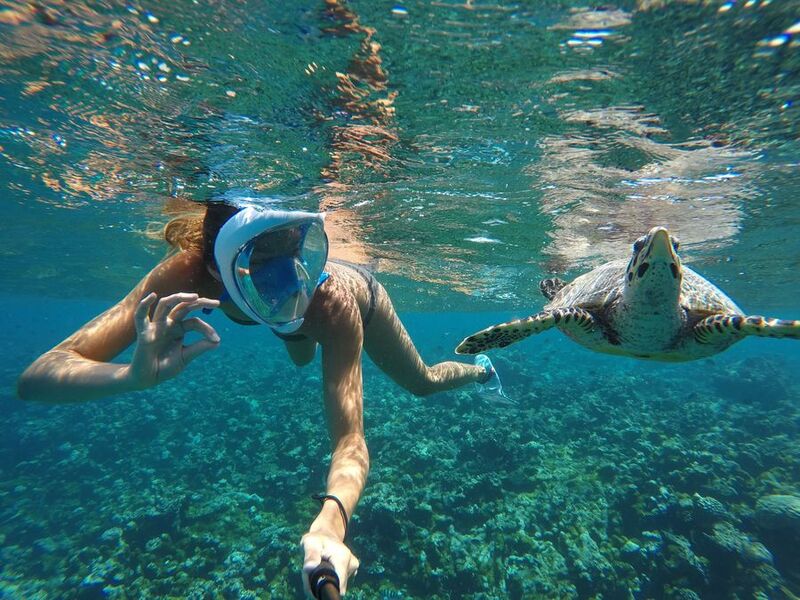 *Just please remember NOT to touch the turtles and always keep a distance. 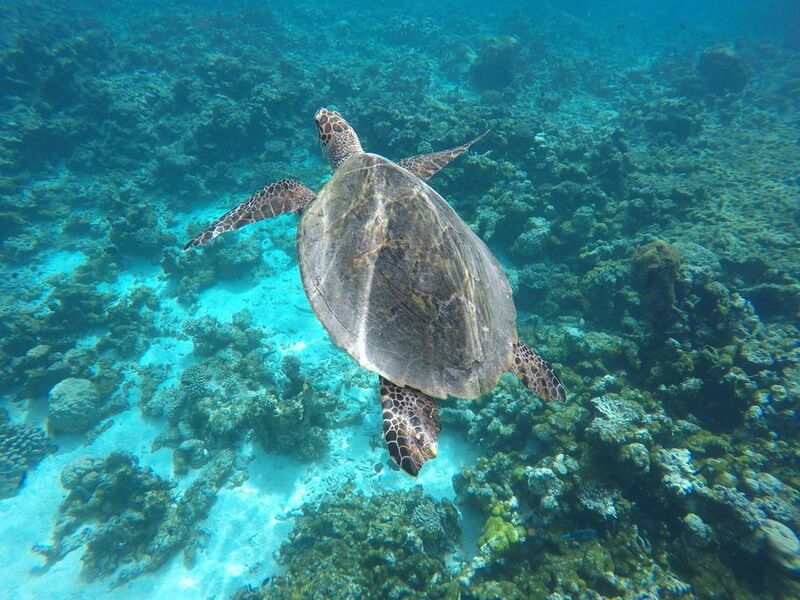 Sea turtles are wild animals and not domesticated pets that need affection. Touching them is not natural. 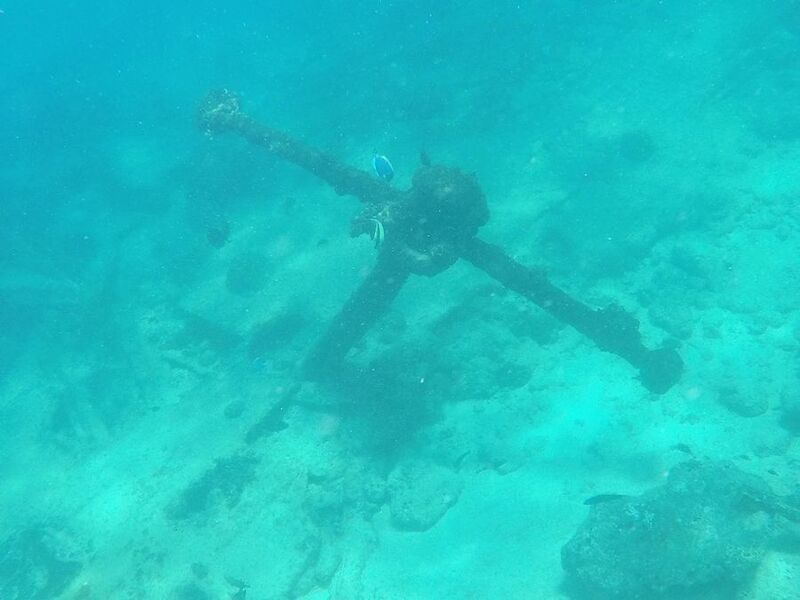 As Gaafaru is located on the important shipping route, we can find many old shipwrecks around the island. In the past, the reef around Gaafaru was not well visible in the storm which is what makes it now a great shipwreck diving location. 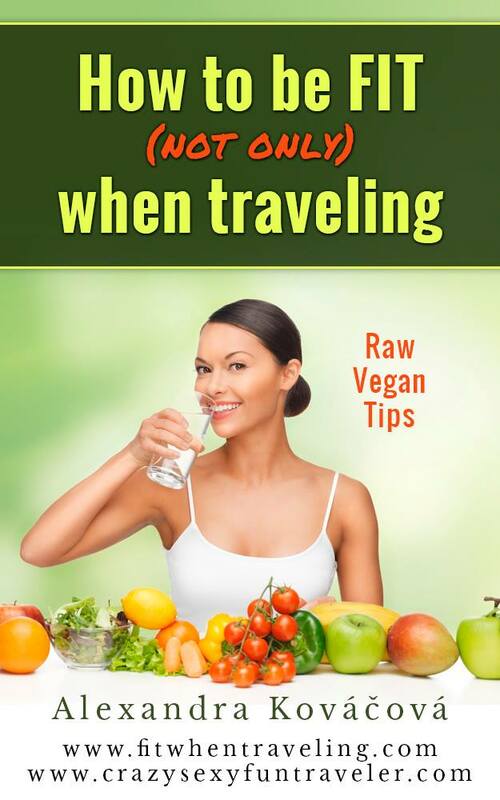 It’s not necessary to go diving though. 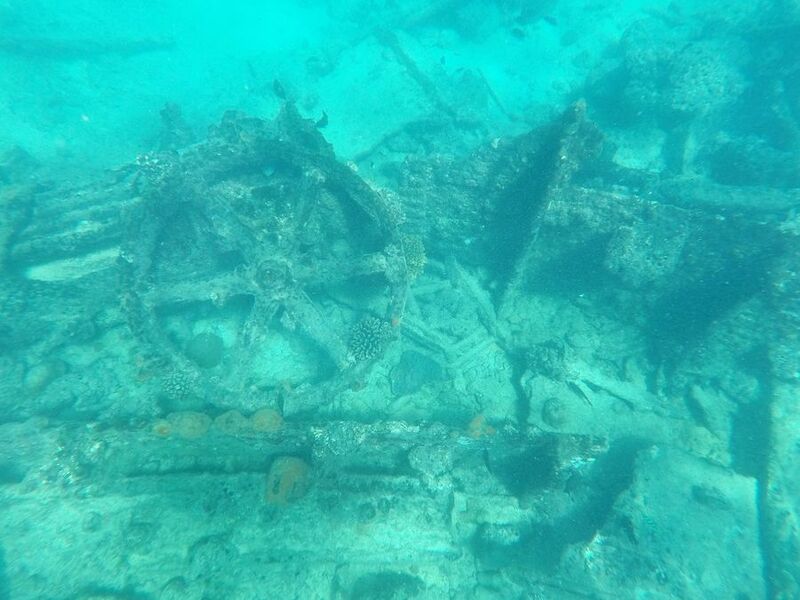 Some shipwrecks are also visible when snorkeling. 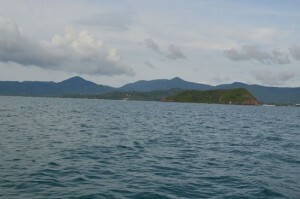 As I dived only once in my life so far, we took a boat to go snorkeling around SS Seagull shipwreck. SS Seagull is now found near the outer wall of the reef in the North of the Gaafaru Atoll. This German steamboat sank in 1879 on the way from London to Calcutta. It is possible to see parts of the wreck on the top of the reef which ranges between 6 to 10 meters in depth. The ship is split in half and is mostly covered with coral, home to many fish. If you would like to go diving there, try to find a small cave, boilers and stern located at the depth of 30 meters. 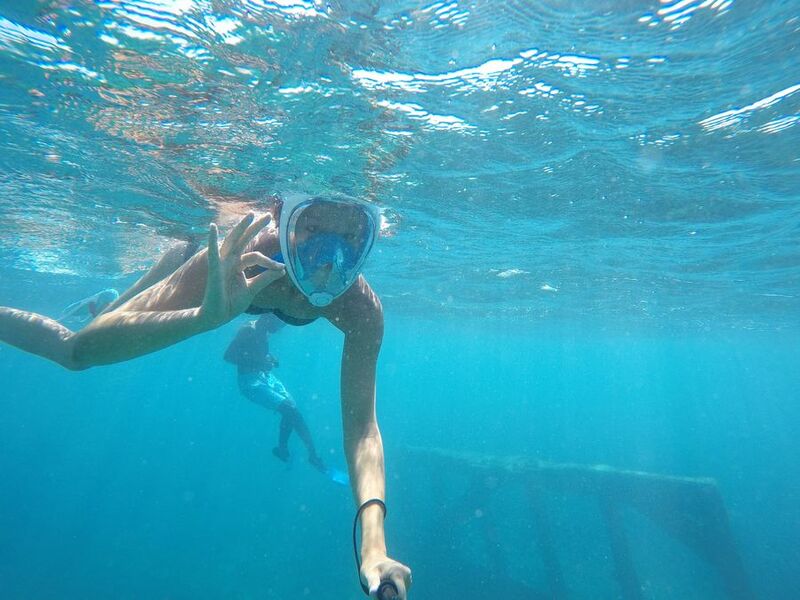 Both snorkeling and diving around the SS Seagull is enjoyed the best when the current is weak. Together with various fish, we saw a big stingray camouflaging under the sand just a few metres from us. You can see also soldierfish, groupers, jacks, blackspotted moray, barracudas, crustaceans, eagle rays etc. 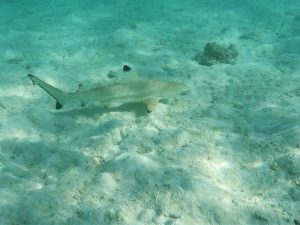 And my guides have also spotted nurse sharks while snorkeling around Gaafaru. Personally, I was not that lucky. You can go snorkeling or diving to other shipwreck locations around Gaafaru as well, such as the Anchor point or Lady Chistine. 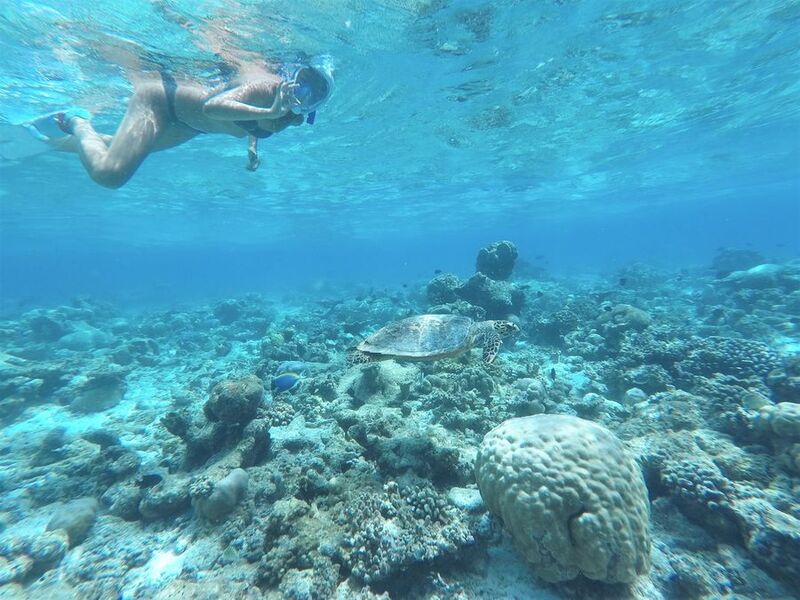 January to May are the best months for snorkeling and diving in Gaafaru. I was there in early October 2017 so thanks to cloudy and rainy weather, the sea was a bit choppy and the visibility not the best. Yet, I was satisfied with what we managed to see around the SS Seagull shipwreck. 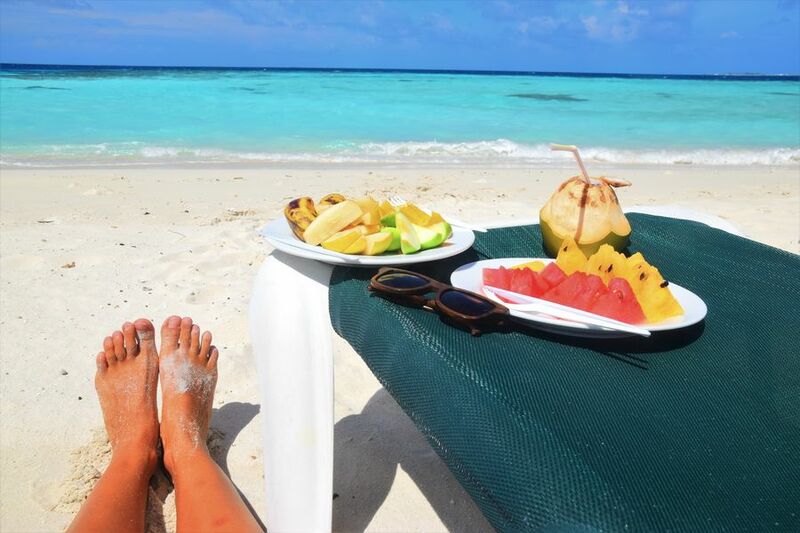 One of the most common activities offered at many Maldivian hotels and resorts is a trip to a picnic island. It’s funny but usually tourists do not realize that it’s always a different picnic island, depending on the location of the Maldivian island you are staying at. There’s no one island called Picnic island in the Maldives. Many islands are referred to as ”picnic islands” because tourists take a boat and go to a different island to have picnic there, hence the name. The picnic island where the Gaafaru tourists are taken is called Kagi. It’s a lot bigger than I expected, with many sunbeds, palm trees, breath-taking white sand beach and good snorkeling not so far away. As I went snokeling almost every single day for more than 3 weeks in the Maldives before that, I decided to just relax on the beach. It was more than stunning, especially because I was there alone for 2 hours until a group of guests from a resort arrived. Until then I had the whole beach to myself only. Next time, I would love to also stay at Kagi overnight as I’ve heard it is possible. To be honest, I loved all the meals I was served at the picnic island. I decided to have both breakfast and lunch there and the Mirian Sky owner agreed on that. 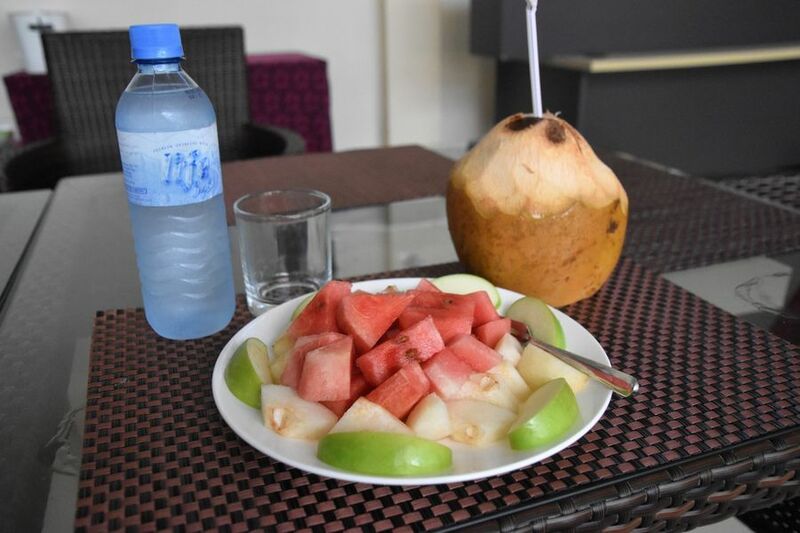 So I got a couple of young coconuts and loads of fresh fruit for breakfast there, and then a few hours later more fruit, also a big veggie salad, another coconut and water, of course. I left with a pregnant belly 😀 But it was also my last day on the Gaafaru island so I guess they really wanted to leave an unforgettable impression on me. Good job! 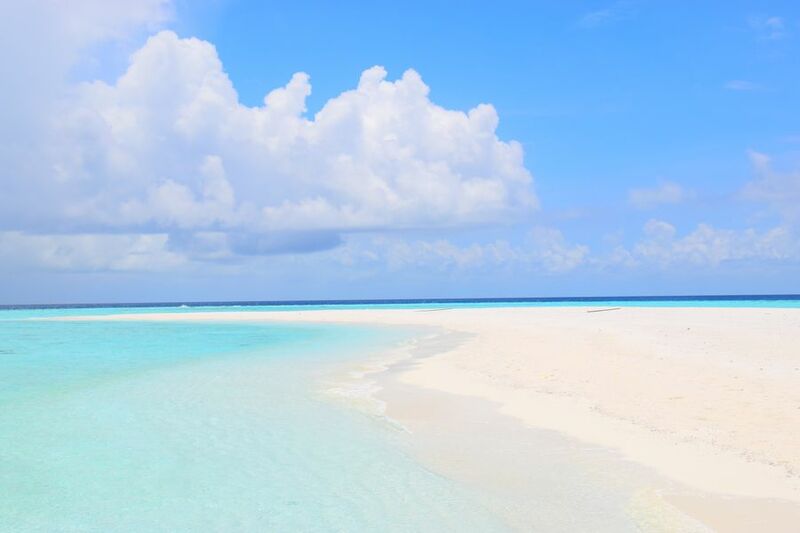 A trip to the Maldives would not be complete without a sandbank visit. Three weeks before Gaafaru, I had a chance to visit Thoddoo island and take a trip to Madivaru Finolhu sandbank where we had the best snorkeling ever. 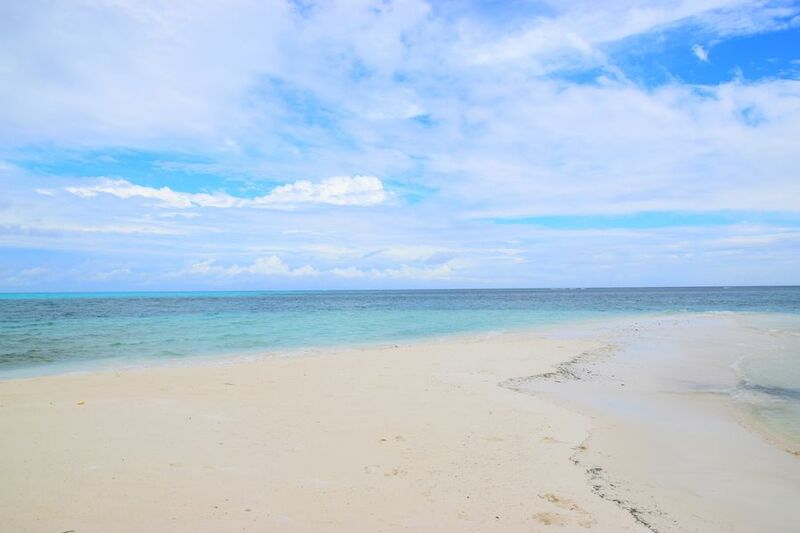 Then a week later, I walked along the sandbank at the Kuramathi Island resort. So taking a boat trip from Gaafaru to Maadhooni Finolhu was my third sandbank visit in the Maldives. 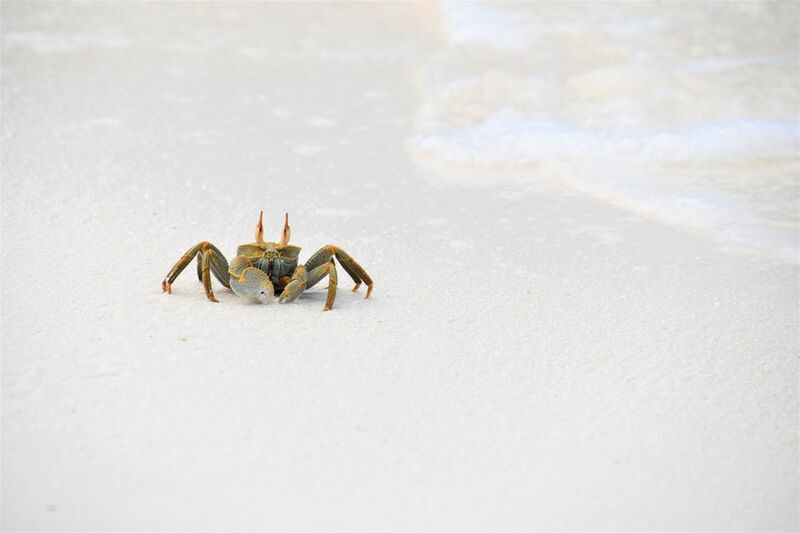 Maadhooni Finolhu sandbank is a tiny white sand island with nothing but loads of sea birds and crabs. Only wish the weather was better when we visited so we ould have stayed longer there. But I usually get really bad weather when visiting a sandbank, and this time was no difference. After taking some nice photos we had to hop on the boat again and leave asap to avoid a big storm. But then again, I was there during the rainy season (September and October 2017). 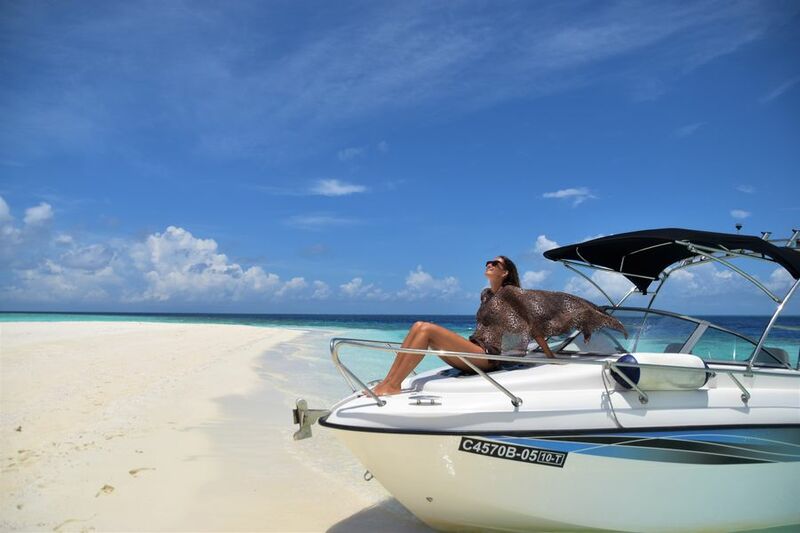 Yet, in my opinion, a sandbank visit is a must when in the Maldives. 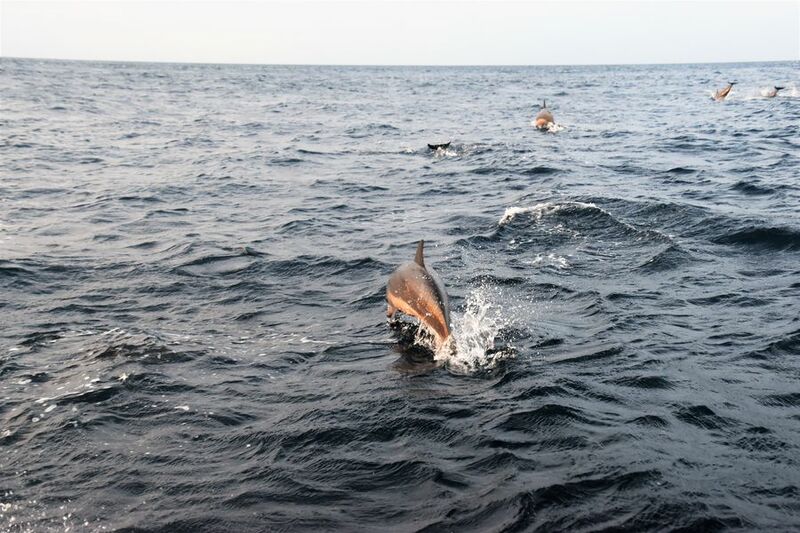 Maldives are an incredible place for sea animals… turtles, fish, sharks, dolphins… Oh dolphins, you gorgeous creatures! 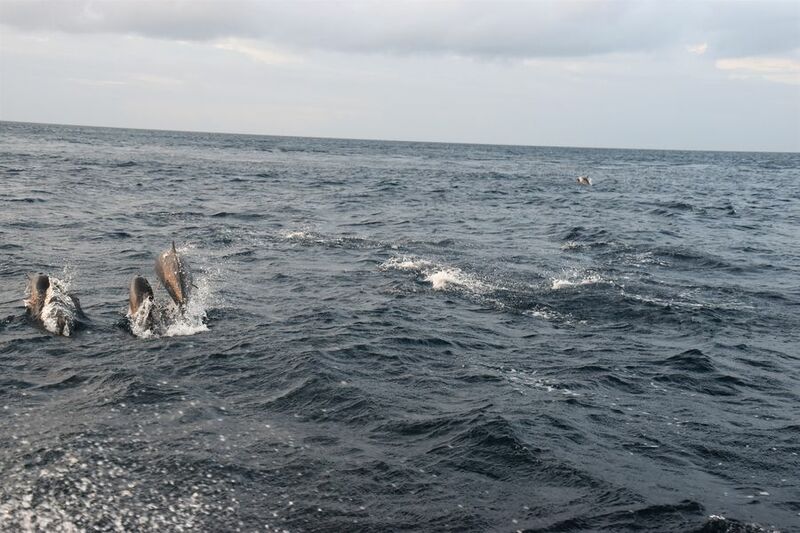 As I can never spend enough time observing dolphins, I simply had to see them in the Maldives, too. TIP: If you have more time, read also my article about another local island and things to do in Thoddoo in Maldives. 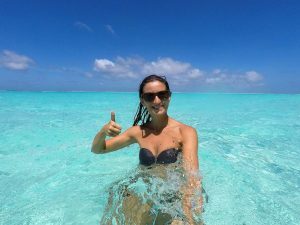 TIP 2: If you are from Slovakia or Czech republic and would prefer to visit Gaafaru or other islands in Maldives with a travel agency that will organize the whole trip and accommodation for you, then I recommend you Maledivy-levne.cz. *Ak si zo Slovenska alebo Českej republiky a radšej by si chcel ísť na Gaafaru alebo iné ostrovy na Maldivách s cestovnou agentúrou, ktorá všetko vybaví za teba, potom ti odporúčam Maledivy-levne.cz.